A year after the death of Rep. Louise Slaughter, one her favorite projects has been named after her. 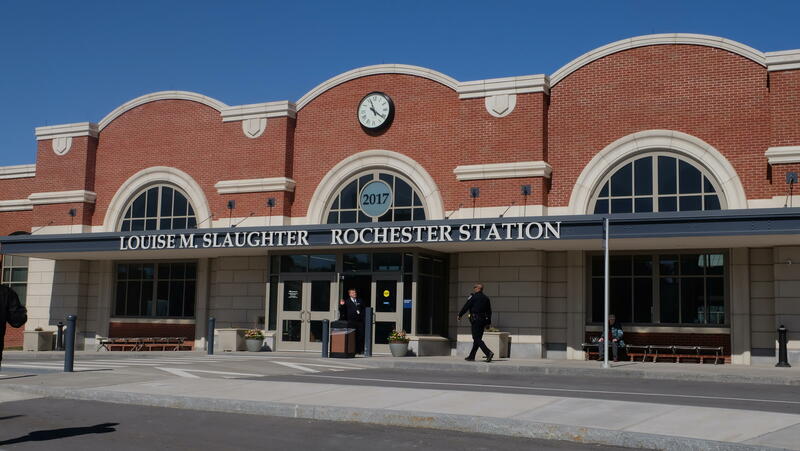 Rochester’s train station is now Louise M. Slaughter Rochester Station. On Monday, leaders like Senator Chuck Schumer shared memories of the longtime Democrat, including when he saw her during his first trip to Rochester. “Everywhere she went, it wasn’t the dog and pony show, everyone knew her,” said Schumer. “And they loved her. And they were talking about their longtime relationships with her. And something she had done for them. They knew how much she fought for Rochester and we still know it today." Slaughter was a dedicated public transit advocate who helped secure the funds for the station. Lt. Governor Kathy Hochul said Slaughter would be pleased because the congresswoman had no love for the previous train station building. “When this building was demolished on November 14, 2015, and the equipment knocked into the building and it came down rather easily. And Louise says ‘I always knew this building was made out of tin,’” Hochul said. One of Slaughter’s daughters, Robin Minerva, said her mother felt a personal attachment to this building project. “She worked for years to get the federal funding to make this building a reality. She was so invested the builders would send her work in progress photos. And she’d come to the house and ask my children if they wanted to photos of my train station,” Minerva said. Slaughter pushed for the train station to be compliant with the Americans with Disabilities Act while also honoring the original Rochester Station design by famed architect Claude Bragdon.